Hummingbird Couriers serves companies that require pickup and delivery of urgent materials on a routine basis. Our dependable, professional couriers will pick up and deliver your package or parcel right when you need us to. We can do it weekly, daily or just once. Simply tell us the type and time frame of your delivery needs, and we’ll make it happen. All of our vehicles are equipped with Hardwired Trackers, which means you never have to spend time worrying where your package is — our technology lets you see your parcel’s exact location at each moment. We understand that life happens quickly. When there’s not time to plan ahead for a pickup or delivery, we’re still here to help. We’ve got the technology and expertise to coordinate same-day shipments tailored to your circumstance. Our mission is simplifying your life by making deliveries you can count on. *Services and delivery times vary by location. Need us right this second? Just give us a call or shoot us an email that includes the locations involved, what kind of pickup and delivery service you need, and the time frame we have to work with. We’ll confirm with you and dispatch someone within minutes. We can even send you a receipt through email or text. It’s that simple. 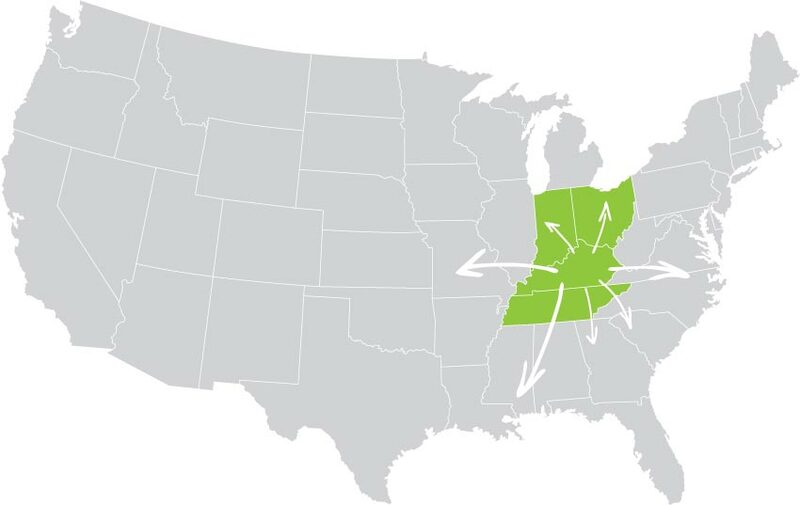 Every week, we make dependable deliveries to happy customers in Kentucky, Indiana, Ohio and Tennessee. Need something delivered outside of our regional zone? No problem. When it comes to our customers, we’re always willing to go the extra mile. Literally. Created in 2006, we are a dependable courier service locally owned and operated by Todd Pehlke. Our headquarters are in Louisville, Kentucky.